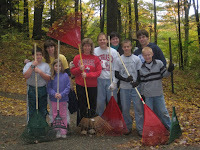 St. Johnsbury Academy Helps Vermont State Parks Rake It In! Jerry Prevost, sophomore dean at St. Johnsbury Academy, challenges his students to do more for the community and the outdoors. As freshman, students at the academy perform community service in the St. Johnsbury area. Once they became sophmores, Jerry wanted their experience to be further from home. "We wanted students to think more about stewardship of the Earth and Groton came to mind". Jerry continues that many of his students live near and use Vermont State Parks and with summer just around the corner, it seemed a timely opportunity for the students to help an organization that in turn protects undeveloped land and educates on some of Vermont's greatest natural resources. Grand Isle: High and dry, this popular park on Lake Champlain is open for business! What’s to love about Grand Isle State Park? What’s to Love About Little River State Park? Thanks to the help of DR Power, Branbury State Park was able to open early last year, much to the delight of swimmers and boaters. Ranger, Lesley Porter, was excited to work with them again this year as they test equipment such as stump grinders, leaf and lawn vacs, and trimmers while helping to clean up area state parks. Don Selby, Product Testing Manager at DR Power in Vergennes says, "It's a win-win situation". 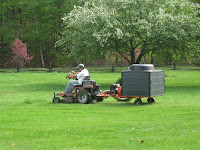 The parks offer plenty of lawn care opportunities for DR Power to test their latest equipment and state parks love the help. Plus, he and his co-workers enjoy getting out of the office and into places like Lake St. Catherine State Park or D.A.R. State Park to rev up their machines. As you probably have seen on our local news channels, water levels on Lake Champlain have reached record highs this spring. What does this mean for state parks located on Lake Champlain? Well, its mixed. Sand Bar, Kill Kare, and Burton Island will not be open for Memorial Day Weekend. These parks are the most impacted by high lake levels. However, nearby Grand Isle, North Hero, Button Bay,DAR, Kingsland Bay, Niquette Bay, Knight Point and Alburg Dunes are all looking good and will be opening at their normally scheduled dates. Deb Markowitz, Secretary of ANR, Takes The Venture Vermont Challenge! In just one day, Deb and Sandra were able to earn 50 points! Impressive. 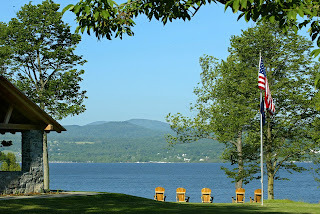 A few more days of that enthusiasm and they will both earn a gold medallion good for FREE day entry into any Vermont State Park all of this season and all of next (2012), a valuable prize! We'll be tracking Deb and Sandra's progress throughout the summer...what will they do next? 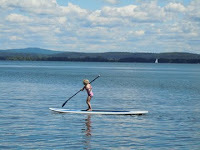 ﻿The weather is perfect for getting outside and doing fun things, which is exactly what Venture Vermont is all about. See some of the great pictures taken by last year's participants and download a scorecard by visiting the Venture Vermont page of the Vermont State Parks website. Good Luck with YOUR Venture Vermont Challenge and we look forward to seeing you in the parks! Wilgus State Park located in Ascutney, Vermont (1.5 miles south on Rt. 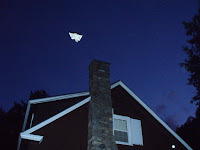 5 from exit 8 on I-91) has a number of unique offerings that many visitors might not know - river trips, a nature observation platform, cabins, boat rentals, quiet picnic spots, regular flying squirrel performances, and a rich history. Dating back to 1933, Wilgus State Park began, as many state parks, with a donation of land from Colonel and Mrs. Wilgus. The park is roughly 89 acres - 30 of which are along the Connecticut River. The history of Wilgus and especially the Civilian Conservation Corps' (CCC) involvement attracted the interest of author Judith Edwards. Her recently published book, Invasion on the Mountain: The Adventures of Will Ryan and the Civilian Conservation Corps, focuses on the CCC's role in creating the infrastructure still used today in Wilgus State Park. Judith will present on her book in Wilgus State Park, Sunday, August 21st at 2PM. Come on out and help Vermont State Parks staff with the tough but rewarding task of getting a park ready for the season! For your efforts, volunteers will receive a punch card or a FREE night of camping! If you are interested in volunteering in one of the three parks listed below, please RSVP by calling Lesley Porter at 802-418-7630 or email her lesley.porter@state.vt.us. Choose to help in one, a bunch, or all! If you can't make it to any of these parks but wish to help out at another state park, please contact the ranger at the park where you wish to volunteer. These phone numbers can be found on the individual park pages on the Vermont State Parks website.